Horseradish (Amoracia rusticana) is a perennial herb, native to Europe and Asia. It’s pungent, spicy taste is famous – or perhaps infamous – and many a taste bud has been shocked into submission by too liberal a helping of this humble white root. But, prepared correctly, it not only adds a special extra zest to your food, but brings with it numerous health benefits. Horseradish roots and leaves have been well known to bring health benefits for hundreds of years. Here are some of the reasons why it has such a great reputation. Anyone who has munched a chunk of raw horseradish root knows this to be true! In fact, my Nanna used to chew raw horseradish whenever she had a cold. It helps your digestive system – in moderation! Horseradish is known to stimulate your appetite. It also helps your gastrointestinal tract to produce more digestive enzymes. A word of warning, though: too much can act as an irritant – especially if your digestive system is sensitive or you have an ulcer. it’s used to treat worms and parasites! I once read a report that said 100g of fresh horseradish root contains 40% of the daily recommended dose of vitamin C . But, frankly, consuming anything like that amount would be crazy. Not only would your taste buds scream at you, but your intestines would consider going on strike. It has been used for centuries to help with lung infections, such as bronchitis, and to deal with bladder infections. Of course, of you want to try this out, please consult a qualified herbalist, to make sure you’re getting advice tailored to your individual needs. Researchers at the University of Illinois found in 2004 that 1g per day of horseradish root may help your liver to detoxify carcinogens, as well as slowing the growth of tumours. This is due to the compounds in horseradish called glucosinolates. Wonderful news! 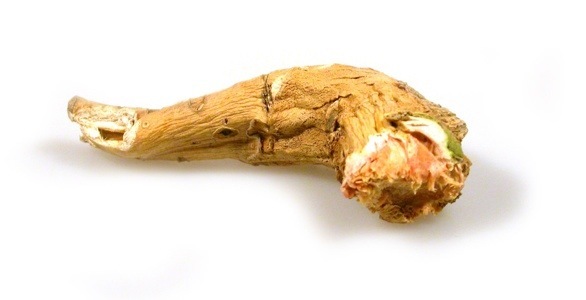 So the humble horseradish root has many health benefits for us, when consumed in moderation. Here are some ideas and recipes for cooking or preparing horseradish roots and leaves. Here’s an essential step by step guide to growing your own horseradish roots and leaves. It’s easy to do – though it can commandeer your garden, if you don’t keep it in check. Do you enjoy eating horseradish? Has it helped you to feel healthier? I’d love to hear your views, via the comments box! I love cooking with horseradish, I even add a spoonful when juicing for an extra kick. It’s without a doubt one of the most rewarding condiments you can eat and will help your body fight against evil diseases! Hey Eat-Mega – love your point of view on this. My Nanna used to use horseradish to clear her sinuses, so it’s definitely potent. I sometimes use young leaves in salads. Will have to give the root a go in juicing – thanks for the tip.